Because it matters to you. We have changed. 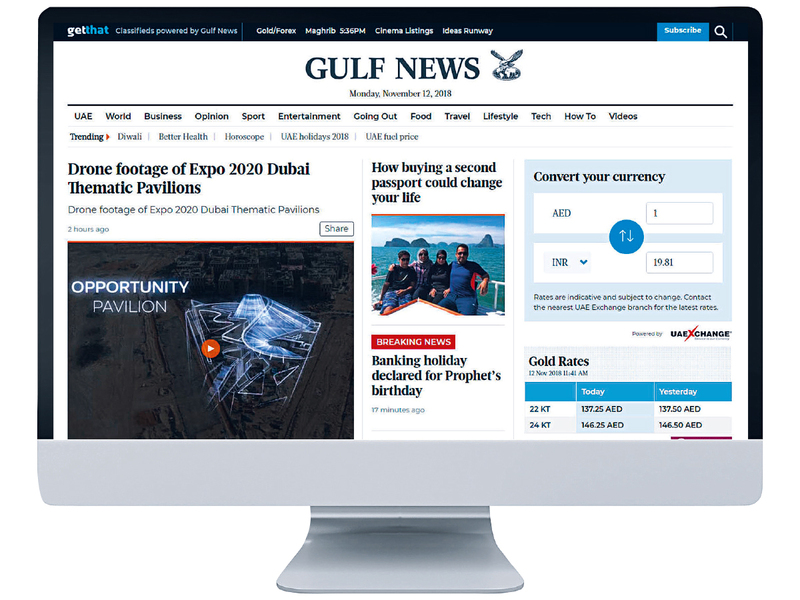 There is a new gulfnews.com Our community matters to us — issues that affect you; matters that pique your interest. We have always told those stories. And as the times changed, we changed too, telling those stories differently on various platforms — be it in print, web or social media. Today, we are firmly in the digital age. You look at your desktop computers, tablets or phones innumerable times all through the day for business purposes or social catch-ups. You want news also in that digital world. The site is responsive; navigation is easy, the design is pleasing to the eye and the search is fast. These are but a few highlights. At a time when the need for speed to break news first is the primary obsession, often compromising accuracy, we take pride of not only breaking news fast, but cross-checking the facts to ensure accuracy. Credibility comes first. Be it print or digital, our story-telling is responsible. We investigate issues, speak to those concerned and break our stories. Ours is not cut and paste journalism. Our new site has stories that affect you, our community. Be it news involving the UAE, change in visa rules, new development projects or even how to register your vehicle — we focus on issues that matter to you. There are in-depth articles that go beyond the news, providing analysis and opinion. We track international stories and those breaking in our region, the Middle East. We also have informed opinion by some of the best known writers in their fields of expertise. While the new site is about display and clarity of font, we have focused on story-telling. It has better visuals; more boxes that give you information and explainer videos. The art of story-telling has changed as man has evolved. Gulf News celebrated its 40th anniversary in September. Forty years is a long time in journalism. Change is constant. Gulf News has always led the change — be it in story-telling, print layout or digital formats. Today we celebrate our new website. We have changed.